Soft Cover, 304 pages, 9.00 x 11.50. With the book's emphasis on grilling, roasting, and one-pot wonders, cooks will love these recipes  simple to prepare for family meals, terrific when combined for entertaining. Beer connoisseurs are already saying "Cheers!" to the book's most compelling feature: the Brewmaster in the Kitchen. Created by Anheuser-Busch experts, "Brewmaster" icons appear throughout, denoting the recommended type of beer  a hoppy lager, an amber ale, or a full-bodied stout, for instance  that best complements each recipe. There's never been a more complete pairing guide than Great Food, Great Beer. 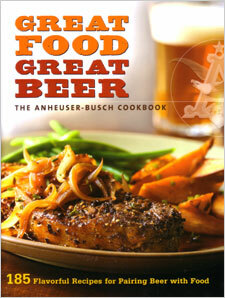 Includes a foreword by August A. Busch IV, President and Chief Executive OfficerAnheuser-Busch Companies, Inc.